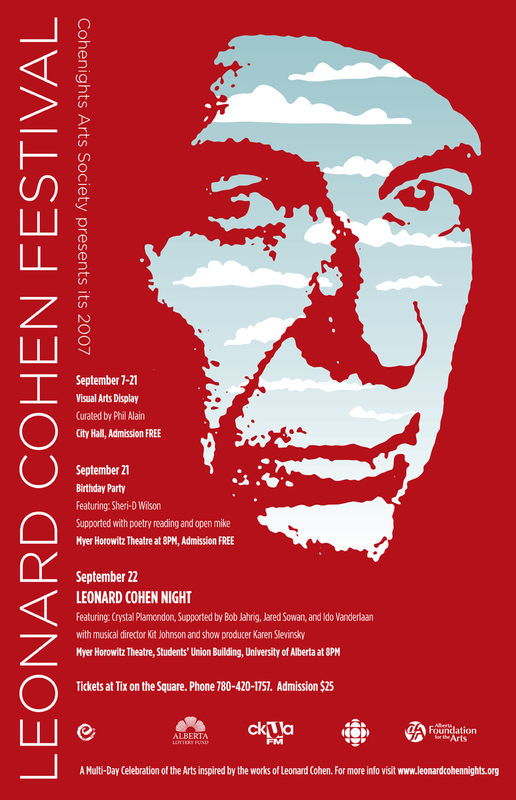 The 6th Annual Leonard Cohen Festival is a brilliant celebration of Canada’s most internationally celebrated singer songwriter. Many Edmontonians enjoy the annual Leonard Cohen Festival as a kick off to the performing arts season. Last year's Leonard Cohen Night concert was a huge success, with the final concert completely sold out. The Cohenights organizers are absolutely thrilled with the incredible response they've received each year from the artists and the public. This year's festival takes a turn on a bigger stage in the beautiful Myer Horowitz Theatre. For more information, please take a look at the Press Release. Click on the poster to see it full size! Tickets at Tix on the Square. Updated! Vue and Intercamp have written articles about the Leonard Cohen Festival. Take a look at the Vue article here and the Intercamp article, here. Pictures from the LCN 2007 Media Launch in City Hall are up! Check them out here. To return to the main page click here.